Self-driving car technology has arrived on the scene. Autonomous-driving cars are no longer just something in science fiction movies: It’s now possible to buy a Mercedes that drives itself. Mercedes-Benz is incorporating a number of autonomous driving features into cars that are available now and models that will soon be available. In fact, the F 015 Luxury in Motion Concept Vehicle offers some exciting options that virtually eliminate the need to sit behind the wheel to watch the road. 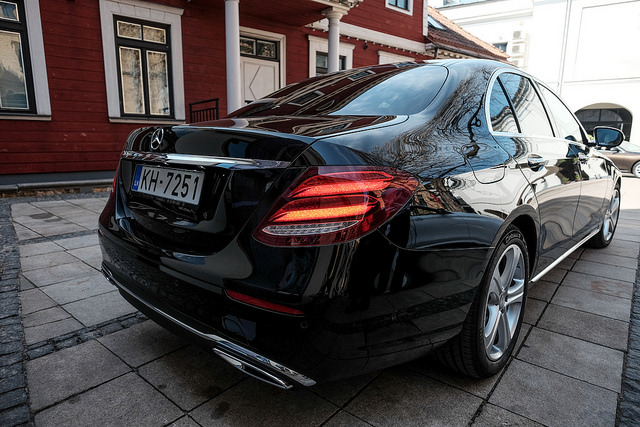 The 2016 E-Class Mercedes has innovative options such as Pre-Safe technologies and Steering Assist. Don’t be left behind as self-driving car technology assumes a firm position on the road. For those asking, “What is autonomous driving?” here’s a simple overview. With the pinnacle of autonomous driving being a fully driver-less car, varying degrees of self-driving car technology are evolving quickly in the automotive industry. Many of today’s vehicles offer semi-autonomous driving options such as active lane-keeping assistance with an alarm or even moving the steering wheel if a driver wanders out of a lane without signaling. High-tech cruise control senses the distance between cars and ensures that a car maintains a safe following distance. The 2016 E-Class offers drivers a host of semi-autonomous driving options. Active Brake Assist helps with detection of potential hazards. This system actively monitors the road and traffic, including the speeds of other cars. If a stationary object or a hazard is detected, the system will perform autonomous braking to reduce speed. Cars equipped with Active Lane-Keeping Assist have a camera on the windshield designed to monitor the road. The camera sends information to a computer, which analyzes it. If the distance between the car and the lane markings changes, the car will sound an alarm to get the driver to perform corrective action. The Attention Assist system monitors how the driver is driving to ensure attention. If a driver becomes sleepy or distracted, a dashboard warning light will illuminate. A warning will also sound to suggest that the driver pull over to take a break. To squeeze into tight parallel spots, drivers can use the Active Parking Assist feature. This system analyzes parking spaces with sensors to determine fit. After a fit is ascertained, the car will drive itself into the spot. Remote parking is available with a smartphone app. For those times when parking is tight and there’s no way to open the doors after squeezing into a space, this app will let the driver step out of the car and then use a smartphone to move the car into the space. Pre-Safe technology is all about detecting accidents before they happen to minimize injuries. Sensors are on constant alert for specific conditions such as skidding, which would indicate that an accident might be about to occur. When detected, seat belts will tighten, the windows and sunroof will close, and head rests will slide into the optimal position to help prepare occupants for an impact. Pedestrian-sensing technology uses night vision cameras to detect people and animals. When they are detected, an onboard screen gives the driver an alert. The F 015 Luxury in Motion Concept Vehicle is a futuristic living room on wheels. Autonomous-driving cars such as the F 015 offer options for autonomous and manual driving. It’s touted as the Mercedes that drives itself: The driver can set the vehicle to the automated system and actually swivel the driver’s seat around to interact fully with passengers. The auto will actually interact with pedestrians, displaying a crosswalk in front of the vehicle for them, for instance. Display panels throughout the cabin make it simple for the driver and passengers to stay in control the vehicle and stay connected.